NARS Purple Rain. I was complaining on Twitter the other day about how disappointed I was in NARS Purple Rain... but I completely take back everything I said. It is darker than I had anticipated based on all the ads and promo pics I saw for it, but that's okay now! Once I put it on my nails I knew how wrong I was. This is awesome. So awesome. I haven't been impressed by any NARS polish since they discontinued all the good colors, but this one redeems them in my eyes. 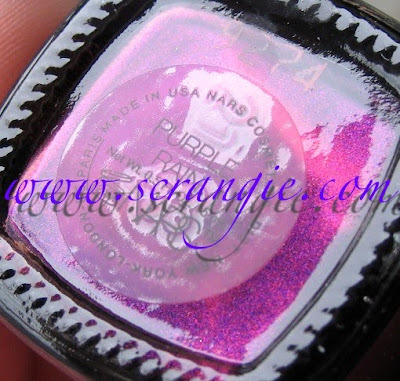 This is a rich and complex deep red toned purple with tons of red and blue shimmer. It is very shimmery and very gorgeous. My picture pulls it more blue than it looks in real life... But you knew that, because you always read what I write under the pictures so you know about my camera and purple, right? Right?!?! (HA!) So yeah, it's definitely a red-toned purple in real life. Not *too* far off from my picture. It's how it looks in the bottle in these pictures. The first thing that came to my mind was that it looks like Illamasqua Baptiste... which it kinda does a little but they're far off enough to warrant owning both. See? Not duplicates of each other. They're both dark purple and shimmery, though! So.... yeah. I really love this. And I think I have... what... 3? 4? Polishes named Purple Rain now. Nubar, Lippmann, this NARS and I swear there's another one. Creative. At least it's not Ruby Slippers! Formula was excellent on this as well. Extremely opaque and dense and very smooth. Just for fun, here's a picture I took of the label. I really like the way this looks. It shows the color accurately, too. it is *very* pretty!! how would you compare it to Zoya's Yasmeen? This color is wickedly gorgeous! Gorgeous color - do you know how similar is it to ChG Lets Groove? That is a gorgeous purple, I love that! Actually, I believe H&M Goddess on Stage is more of a dupe of Illamasqua Baptise.. I love both the Nars and the Illamasqua! that's my kind of purple! beautiful. I like it better that the Illamasqua color. That looks exactly, and I mean exactly, like ChG Let's Groove, probably my favorite polish of all time. Boy am I glad I came and looked at your photos even though I saw your Tweet about this! Haha! This is stunning, and your pictures are great! I often wonder how much of my blathering folks read, too, by the way. gorgeous color indeed! i thought of Prince immediately when i read Purple Rain lol. I've been eyeing this since I saw the promos on different blogs. Definitely a must have! It'd be interesting to compare all of your Purple Rains to see how different they are. Anyway, this is pretty, maybe it'll be my first NARS! BTW, how many coats, two? LOVE purple polish. looks great on your nails! I've been on a NARS boycott since they won't bring Zulu back, and this is the first time I've actually felt regret over it. That is a beautiful color! Alright. Finally a polish named Purple Rain Prince would approve of! While I can't really speak for Prince personally, I would say that much of his wardrobe would coordinate with the Nars version of Purple Rain. I have a friend who is a big Prince fan. Nars - Leeds in Harvey Nicks so there is hope of owning this whilst living in West Yorkshire, fab! Ok, those purples are delicious...omg...love love love. I MUST have this! It looks AWESOME! Oh I love those! I love dark colors that are on the verge of black for nail polish colors. That color looks a lot like an ELF nail polish I got on Christmas. It came in an ELF three pack of polishes. The three pack had that color purple, a dark blue, and a white/silver. OMG! You have like the most beautiful nails I have ever seen. I am really jealous. On top of that you take the most stunning pictures ever. Lovely! Purple rain looks wonderful, I really like purple.. and red.. and.. gold.. and a lot.. This really isnt good for my wallet.. I want more and more polishes..
China Glaze had a Purple Rain that was light gray-lavender with light blue shimmer. Gorge! How do you keep your cuticles so nice? Mine are dry as the sahara! I love your blog. I really do. Thanks a lot for having this, it helps me a lot with deciding what polish I should buy now. :3 And if you don't have it. I just take a leap. I follow you on twitter (Renchanz), saw the tweets, and thought I had to tell you what an amazing job you're doing. Also, lovely color in this blog, I have to find out where I can buy this here. I'm also curious if you think it's pretty close to Zoya Yasmeen. I did my nails in Yasmeen today and it looks almost exactly like your swatch of Purple Rain.